On Sunday March 21, Tony Stone, Iain Small and I linked together a series of grooves up the right side of Orion Face before finishing up the very steep headwall between Orion Directissima and Slav Route. We climbed the first three pitches of Zero Gully to reach the grooves which led in three pitches to the final headwall. This is breached by a vertical groove on its right side which gave a superb mixed finish. Whilst sections of the lower grooves have been climbed many times by parties doing Slav Route, it is unlikely that the headwall pitch had been climbed before. We called the route Orion Grooves (VI,5), and similar to Orion Directissima, it provides another way up Orion Face for Ben aficionados who have already ticked off the well-known classics! 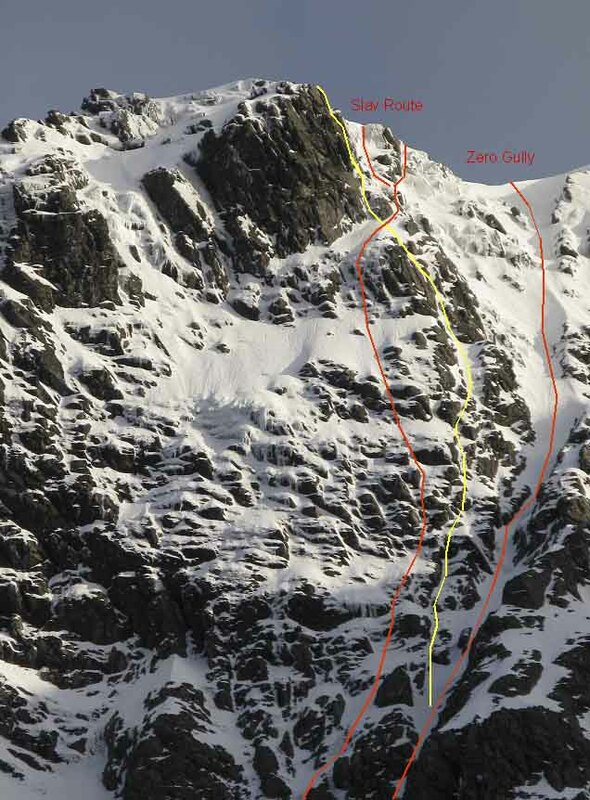 This entry was posted in New Routes, Topos and tagged Ben Nevis, Iain Small, Orion Face, Simon Richardson, Tony Stone. Bookmark the permalink.